It was an emotional match for Liverpool fan Seán Cox as he spent his first night in public since he was attacked cheering on his beloved Reds. 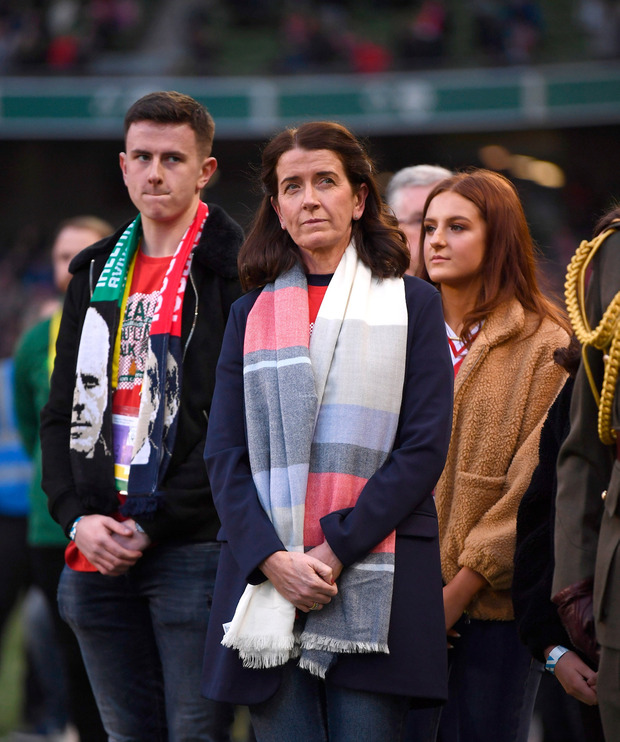 The Aviva Stadium erupted with the thundering cheers of 26,000 football fans as the 54-year-old’s wife Martina raised her hands to greet supporters before the game between the Liverpool Legends side and Ireland XI. As she walked on to the pitch, the mother-of-three held back tears and embraced the special moment. The Liverpool Legends, managed by Kenny Dalglish and captained by Ian Rush, faced an Irish XI managed by Mick McCarthy and skippered by Robbie Keane. The Cox family have been to hell and back since Seán suffered horrific injuries in an unprovoked attack by Roma fans outside Anfield. But last night was a moment for celebration as Seán, from Dunboyne, Co Meath, continues his road to recovery. 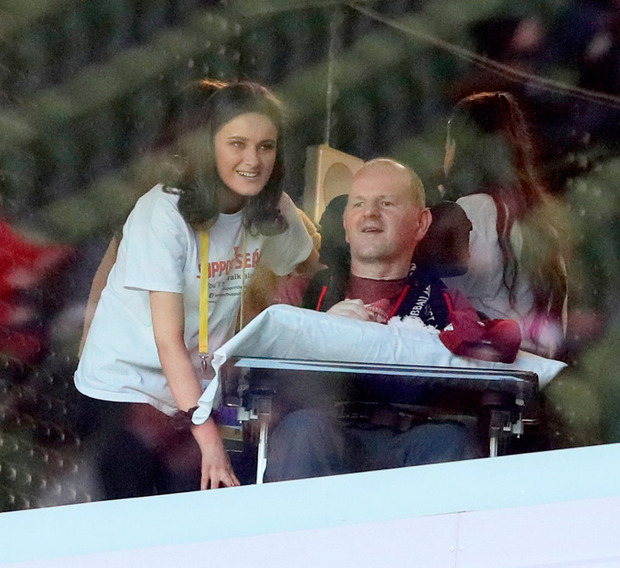 President Michael D Higgins attended the game too and met Séan’s wife and children – Jack, Shauna and Emma – on the pitch, as thousands of fans sang Liverpool anthem ‘You’ll Never Walk Alone’. The occasion took a lot of preparation from the Cox family and his medical team to ensure he could make it, but judging by the success of last night’s event it was all worth it. A statement from Mr Cox’s wife Martina read: “The last 12 months have not been easy for us, but what has helped us get through this difficult journey has been the outpouring of support and genuine concern for Seán. It is nearly a year since Seán Cox suffered major head trauma when he was hit in a random assault by a masked AS Roma supporter outside Liverpool’s stadium. Irish legend Robbie Keane said it was a fate that no person or their family should ever endure. “You go to a football match to enjoy the day, enjoy the game and support your team,” he wrote in his programme notes. “Thousands, if not hundreds of thousands, of Irish people go to watch Premier League teams each season. After the emotion, there was the small matter of the game. Ireland took the lead through Keith Andrews, before Liverpool levelled thanks to a John Aldridge penalty. A second half strike from Vladimir Smicer settled the game for Liverpool but last night was about more than the fare on the pitch. Seán was given a rapturous round of applause when an image of him was projected on to a screen. All the funds raised on the night went towards the Seán Cox Rehabilitation Fund.